Developing easy read information isn’t easy. 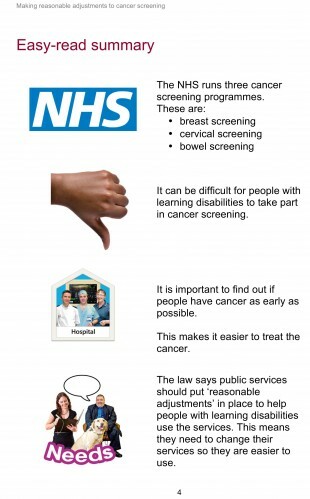 That’s why we’ve set up a new group to look at how to develop high quality national easy read information about screening. The group – consisting of members of PHE Screening’s Information and Education for Public and Professionals (IEPP) team along with learning disability experts and self-advocates from across the country – met for the first time at a workshop in Bristol. All 11 national screening programmes aim to ensure equity of access for everyone who is eligible for screening. 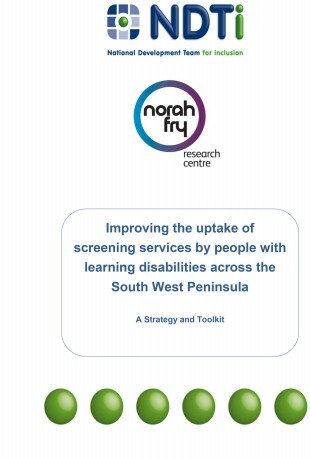 Up until now, however, the provision and quality of accessible easy read information for people with learning disabilities has varied widely between national programmes and between local providers. The aim of this new group is to put that right. At the workshop, we discussed what common principles and processes are required to ensure all new and revised national easy read information is high quality and fit for purpose. We also reviewed the most recent easy read drafts of the Screening tests for you and your baby (STFYAYB) booklet for pregnant women. We anticipate that the group will be able to sign off new easy read versions of STFYAYB later this summer before helping with other easy read projects involving all 11 national screening programmes. This was a good workshop, and I thought that Public Health England representatives really listened to experts by experience and practitioners in the field about what would work for them. Much of the information we looked at is complex and difficult to put into easy read, and so it was important that everyone had time to think about and discuss the issues. It will be very useful to have good national easy read information on these topics for everyone to use. The small group setting and range of professionals invited created a friendly and productive atmosphere. I was very pleased in the way that Nicholas (expert by experience) was really listened to, with his opinions and views respected and in demand. It was a very worthwhile workshop, which we left feeling we had contributed something of value. The pace of the day was great, with just the right amount of work time and break time planned in. Often, there can be an overload of information with too much packed in, but this was not the case with your workshop. We look forward to working with you again. All public sector organisations have a legal duty under the Equalities Act 2010 to make reasonable adjustments for people with learning disabilities. In addition, by 31 July 2016, all organisations that provide NHS or adult social care must follow the Accessible Information Standard. This tells organisations how they should make sure people receive information in formats that they can understand and receive appropriate support to help them to communicate. This includes making sure that people get information in different formats if they need it, such as easy read. Please look out for further blog posts that we will publish as we make progress with our easy read work to ensure equity of access to screening. Easy read materials are useful for all walks of life, not just for those with learning disabilities. It would be useful if the materials did not specify they are specifically for people with learning disabilities to avoid those without a learning disability discarding the material as 'not for them'. Yes, we came to exactly the same conclusion at our workshop. The consensus was that the leaflets should be titled 'An easy guide to...' rather than 'An easy read guide..' and that they should not state they are specifically for people with learning disabilities.